She grew up in Lee County, Miss., moving away in 1957 after a group of white neighbors threatened her life. Arriving in Milwaukee in 1957, Mrs. Champion landed a job as a machine operator with Sperry. She was the second black hired. The first was a cleaning woman. In a 1992 interview with the Milwaukee Sentinel, Mrs. Champion said many of her coworkers were recent German immigrants and puzzled by her racial heritage. “I was very fair complexioned and had a southern accent. They weren’t sure what to make of me,” Mrs. Champion told the Sentinel. When her co-workers learned she was black, the taunting began. The supervisor, a Mr. Knapp, gave her a cup of coffee and left the office to call the workers together for a meeting. Mrs. Champion continued to work at Sperry. She was promoted to a supervisory position within a year. In her later years, she became very active in the Milwaukee civil rights movement, participating in numerous rallies, marches, and sit-ins. A 1930s company advertisement described its famous Chicken Dinner candy: “It’s the bar with the old-fashioned peanut bar center, and it has a thick layer of delicious caramel and layer of fudge-like French cream. And it’s thickly coated with nourishing milk chocolate.” No poultry products were used, just milk chocolate, peanuts, milk, syrup, and sugar. To those ingredients, in 1957, might be added two more: integrity and decency. Great article, but did those trucks (and Mrs. Champion), end up at Champion Chicken on west Lisbon around 89th? 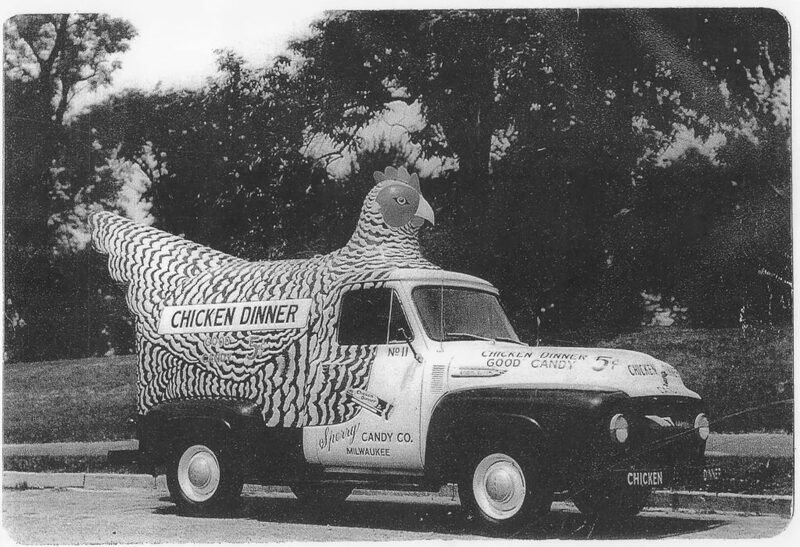 We lived out there and saw those trucks at a place called Champion Chicken that actually sold chicken dinners. My mouth is watering just thinking about those delicious candy bars ! Yay! Mrs. Champion! yo uare indeed a Champion!